Written when Nazism was fashionable, the lucid examination of anti-Semitism presented in this volume is of importance for Christians who have the courage to think, as well as for theosophists and citizens of good will in general. More than one theosophist forgets in our century that the roots of religious intolerance and fanaticism must be unmasked, understood and abandoned before intercultural dialogue can take place. The task was vigorously started by Blavatsky and her Eastern spiritual teachers in the first years of the theosophical movement. The presence of this duty in the theosophical agenda must not be forgotten. Nicolas Berdyaev is a reference in Christian honesty regarding the theological crimes and “religious hate”. He admits, for instance, that most Christians do not follow Christ’s teachings. “At all events”, he says on page 27, “true Christians, free from all formalism, nominalism and conventionalism, will always be a minority”. Helena Blavatsky said that real theosophists are seldom too numerous. The New Testament makes similar statements in a number of passages. In our century, Berdyaev’s approach to the problem of hatred against the Jewish people has a great practical value for citizens of good will. It is especially useful for those who study eternal wisdom and the law of universal brotherhood. 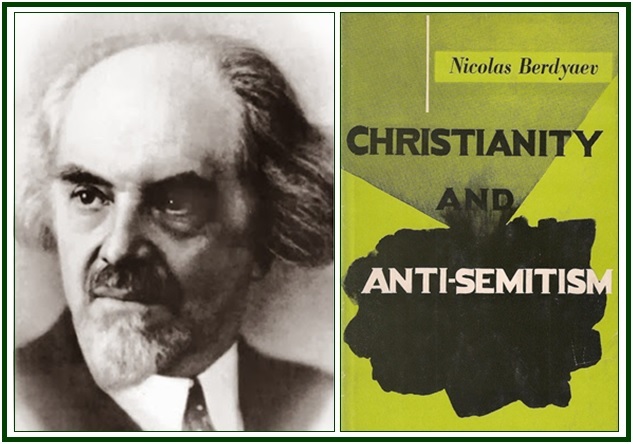 “Christianity and Anti-Semitism”, by Nicolas Berdyaev, with a commentary and notes by Alan A. Spears, Philosophical Library, Inc., New York, USA, 1954, 58 pages. See for instance volume II of her 1877 book “Isis Unveiled”, which is dedicated to “Theology”.